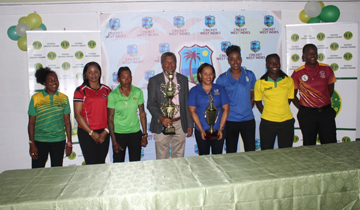 The respective team Captains and CWI Director Anand Sanasie and Josina Luke display the trophies at stake. Colonial Medical Insurance Women’s Super 50 continues today. Jamaica, who won their first round encounter against Windward Islands by 80 runs at Bourda, along with Trinidad and Tobago and Barbados, who overcame Leeward Islands by seven wickets at Everest on Sunday, are on five points each, while Guyana, Leeward Islands and Windward Islands have not yet registered a point. Chinelle Henry, Natasha McLean, Stephanie Taylor, Rashada Williams and Chedean Nation are capable batters and will look to get among the runs once again and give their bowlers a decent total to defend. Vanessa Watts and Henry did well to help restrict Windward Islands in their opening game. Guyana skipper Shemaine Campbell batted solidly against Trinidad and Tobago before she was run out for a top score of 45 and Sheneta Grimmond were the only two batters that showed resistance in their opening game; they will need support from Tremayne Smartt, Melanie Henry, Akaze Thompson and Shabika Gajnabi to give the local fans something to cheer about. While left arm seamer Evra Giddings got the ball to swing and put Trinidad and Tobago on the back foot early on with two wickets in the first over, and her new ball partner Smartt bowled well but wasn’t utilize for her full quota, the Guyanese must improve in this area as their performance was below par at Providence with too many wayward balls. The surprise non selection of pacer Subrina Munroe in the final squad has left a void in the attack which was without the talented Mandy Mangru in the opening game. The Everest pitch is expected to favour the batters. Trinidad and Tobago will take on Leeward Islands at Bourda and Barbados will play Windward Islands at Providence.